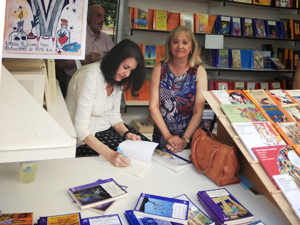 Signing of books at the Madrid Book Fair 2018 with Ediciones de la Torre. 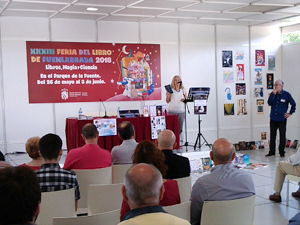 Presentation of “La pared y otros cuentos de lo extraño y lo sobrenatural” at the Fuenlabrada Book Fair, 27th May 2018. 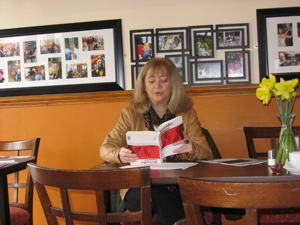 Presentation of “La pared y otros cuentos de lo extraño y lo sobrenatural” at Café Madrid, 25th April 2018. 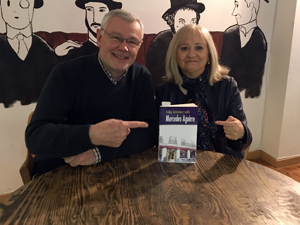 Presentation of “Vidas, historias y cafés” in café Pombo in Madrid, 24th February 2018. 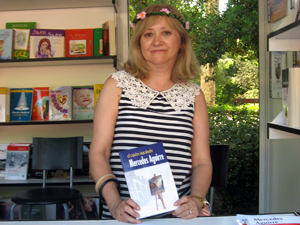 Signing of books at the Madrid Book Fair 2017 with Ediciones de la Torre. 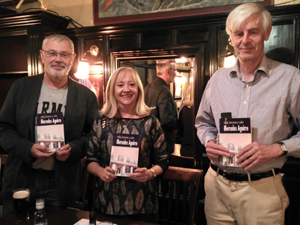 Presentation of “Vidas, historias y cafés” in James Joyce Pub in Madrid, 7th October 2016. Presentation of “Vidas, historias y cafés” in Casavieja (Avila), 23rd May 2016. 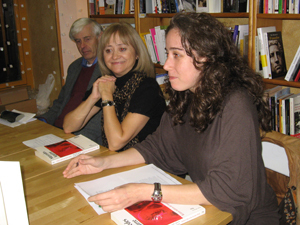 Presentation of “Vidas, historias y cafés” in the Semana Complutense de las Letras (Facultad de Filología, Escolar y Mayo bookshop), 20th May 2016. 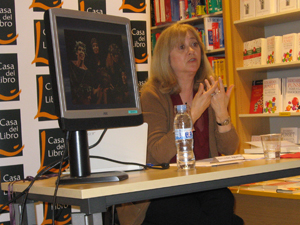 Presentation of “Cuentos de la mitología celta”, at Casa de Galicia, Madrid, 26 January 2016. 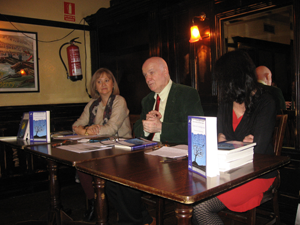 Presentation of “Cuentos de la mitología celta”, James Joyce Pub, Madrid, 14 January 2016. 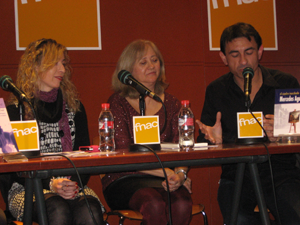 Presentation of “El cuadro inacabado” in FNAC Valencia, 15 January 2015. 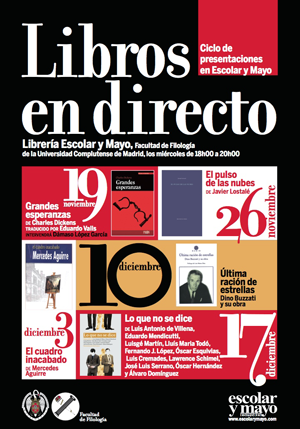 Presentation of “El cuadro inacabado” in “Libros en Directo” organised by the Faculty of Philology, Universidad Complutense, in the bookshop Escolar y Mayo, 3rd of December 2014. Presentation of “El cuadro inacabado” in Museo del Vidrio y el Cristal, Malaga, 20th March 2014. Presentation of “El cuadro inacabado” in Fundacion Caja Murcia, Murcia, 6th March 2014. 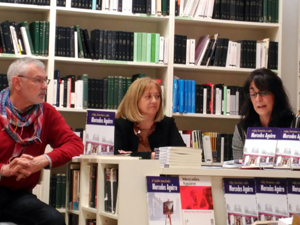 “Recorrido por la mitología” with Mercedes Aguirre, Richard Buxton and María Dolores Castro, in Casa del Libro (Madrid). 13 November 2013. Presentation of “El cuadro inacabado”. 25 October 2013. Joint presentation with Kevin Crossley-Holland “Myths and Legends and what they tell us about life”. 27 October 2013. 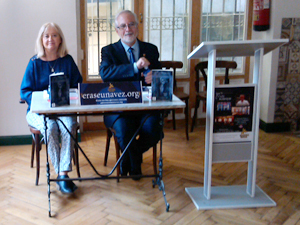 Presentation of “El cuadro inacabado” in “La Livreria” Madrid 3 October 2013. “Semana Cultural” of the Department of Hispanic Studies (University of Bristol) – “Mercedes Aguirre in conversation: Relatos miticos del mundo cotidiano”, 12 March 2013. 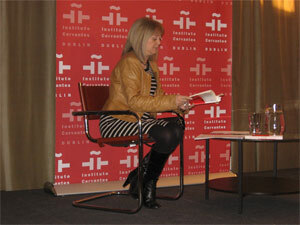 Presentation in the Instituto Cervantes in Dublin of “Relatos miticos del mundo cotidiano”/”Mythical Tales of the Everyday World”, 4th of March 2013. 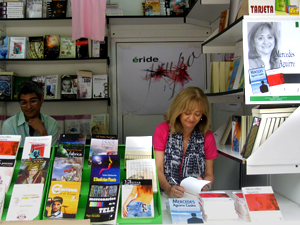 Book fair: Éride Ediciones; Madrid, June 2012. 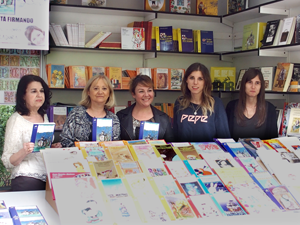 Book fair : Ediciones de la Torre; Madrid, June 2012. 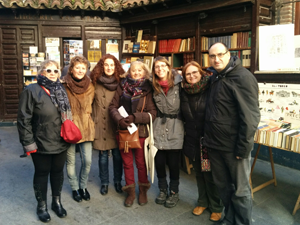 Workshop on Mythology in Casa del Libro; Fuencarral, Madrid, March 2012. 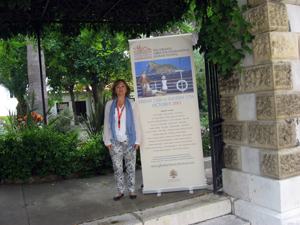 Participation in “Semana-Cultural-Week” in the Department of Hispanic and Latin American Studies, University of Bristol: “Escribiendo con los mitos: Déjame morir por ti y otras Historias”; 5-10 March 2012. 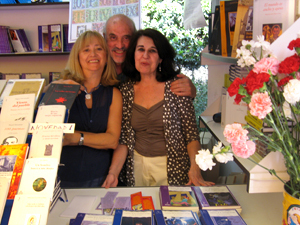 Presentation of Mythical Tales of the Everyday World in Las Tres Rosas Amarillas Bookshop; Madrid, November 2011. Presentation of Mercedes Aguirre’s work in “Tertulia” at Spike Island; Bristol, November 2011. Presentation in the Bookshop “Oletum” with Televisión Castilla y Leon; Valladolid, June 2011. 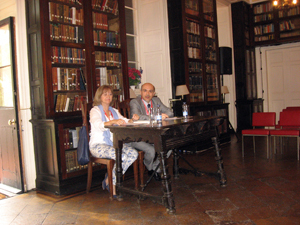 Presentation in the literary event “La novela, un recurso inestimable para el ser humano”; Astudillo (Palencia), June 2011. 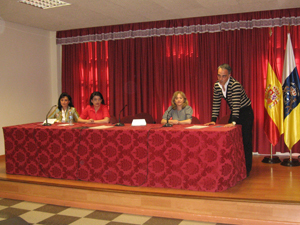 Presentation in the “I Encuentro de escritores noveles” in the Cultural Centre Los Cristianos; Arona (Tenerife), March 2011. 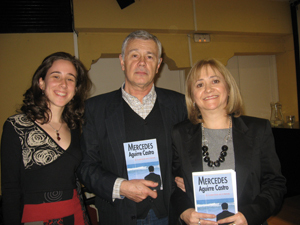 Presentation of El narrador de cuentos in Euskal Etxea; Hogar Vasco de Madrid, March 2010. Presentation of Nuestros mitos de cada día in El Circulo de Bellas Artes; Madrid, September 2009. Creative Writing Workshop “Short Story and Classical Mythology” in the “Semana Complutense de las Letras” 26th of April 2017, University Complutense, Madrid. Creative writing workshop: Introduction to the genre of crime fiction, 1st October 2016. Creative writing workshop in the Asociación Cultural Life Three, Madrid, 1st October and 19th November 2016. Creative writing workshop: “Writing with myths” in the Semana Complutense de las letras (Biblioteca María Zambrano), 20th May 2016. Creative Writing Workshop on crime fiction. Seminar on myths II: Classical Mythology and English Literature. Seminar of mythology: Myth and Immortality. Literature of the Ancient World. Classical Mythology (Undergraduate degree in Modern Languages, Undergraduate degree in Comparative Literature). Themes, motifs and forms of Greek Literature (MA in Classics). “Fantasmas, aparecidos y muertos sin descanso”. “El jardín como lugar de encuentro de la literatura y el arte”. 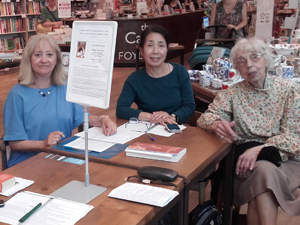 Tapas Literarias is a reading group on literature in Spanish in collaboration with Bristol Spanish (in Foyles bookshop, Bristol). Interview with Emma Bridges for The Open University: Practitioner’s Voices in Classical Reception Studies. Interview in the Instituto Cervantes in Dublin about “Relatos miticos del mundo cotidiano”/”Mythical Tales of the Everyday World”. Participation in a discussion about the Classical myths in the Spanish televisión chanel TNT. Interviews in the Spanish Radio chanel Cadena SER (SER Historia) about Troy and other Greek myths. Participation in the television series “Mitos y Leyendas (Televisión Española, La 2). Presentation of “El cuadro inacabado” in the radio programme SER Historia of “Cadena SER”.